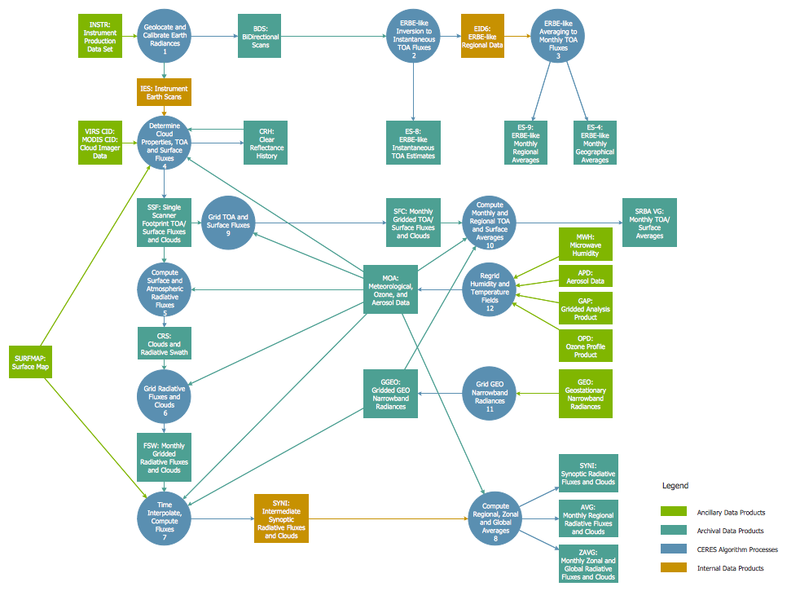 Using the “Data Flow Diagrams” solution in ConceptDraw STORE. 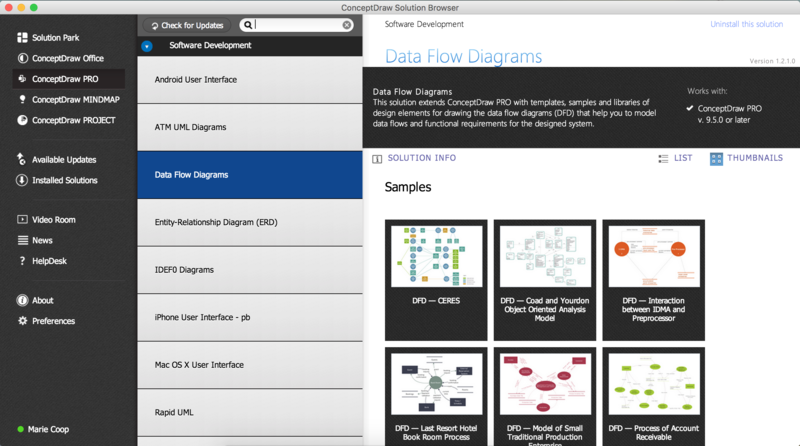 The design elements library "Data flow diagram (DFD)" contains 15 symbols for drawing both context-level data flow diagram and Level 1 DFD. The design elements library "DFD, Gane-Sarson notation" contains 12 symbols of Gane-Sarson DFD notation. The design elements library "DFD, Yourdon and Coad notation" contains 22 symbols of Yourdon/DeMarco DFD notation. Use these database flowchart symbol libraries to design the process-oriented models, data-oriented models, data flowcharts, data process diagrams, structured analysis diagrams, and information flow diagrams. This sample shows a CERES data flow diagram. The design is large and complex, but its creation in ConceptDraw DIAGRAM using pre-designed objects, took just minutes. Use the legend to make additional comments. Functional modeling allows to make complex business processes simple. One of the basic methods is IDEF0 and one of the most effective also. To create a business model, use flowchart symbols. 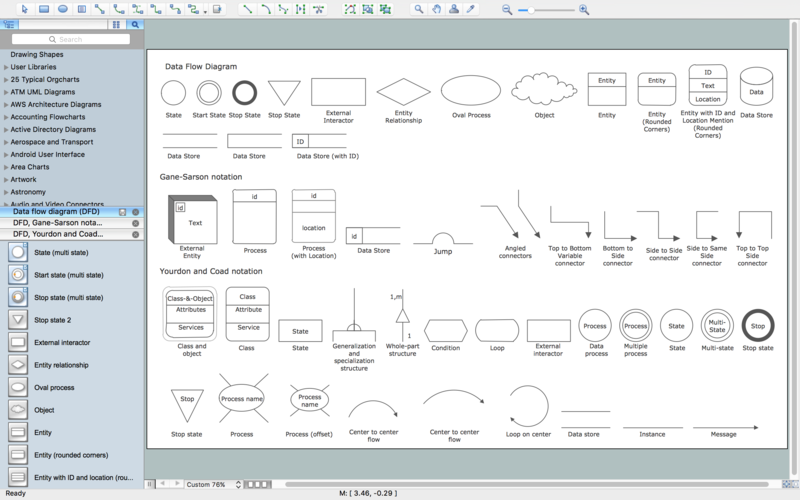 The IDEF0 library, supplied with ConceptDraw IDEF0 Diagrams solution contains 18 IDEF0 basic notation symbols. All symbols are the vector graphic images what means, that one can customize their size preserving the stable quality. Another library of IDEF0 symbols can be find out in the the Business Process Diagrams solution, included to the Business Processes section of ConceptDraw Solution Park. These libraries composed from just vector objects and are totally compatible. You can apply the IDEF0 symbols from both libraries at your flowcharts, if needed. Many IT experts say that Android is the future of computing. Already today the sales of traditional laptops and desktops drop rapidly in favor of touch-screen devices running Android and it's derivatives. So what about drawing digital diagrams on Android? We have collected top 5 Android flow chart apps for you below, including: DrawExpress Diagram, TouchDraw, DroidDia prime, Polydia Diagram Editor and Edgy. You can find these apps on Google Play Store and decide which one suits your needs best. The experience of applying some standard symbols for making diagrams depicting sequential stages of any organized activity become habitual. This diagram illustrates the basic set of symbols that are standard when making flow charts and other process flow charts. The flowchart's basic symbols depict all the steps, process involves. Relationships between steps and an order of the actions, are indicated with the arrows - ended lines. There are a large number of symbols used for specific flowcharts (DFD, workflow, process flow, etc), but the basic library of flowchart symbols consists from not more than ten entities. The UML diagram is a powerful tool which lets visually represent all system's components, the interactions between them and relationships with external user interface. The Rapid UML solution for ConceptDraw DIAGRAM v12 software offers diversity of UML flowchart symbols for drawing all types of UML diagrams. Data Flow Diagram is used to depict the flow of data through the system, where it enters and exits the system, as well as where it is stored. To simplify the process of drawing a data flow diagram (DFD), ConceptDraw DIAGRAM v12 provides a DFD Library - design elements that will help you make your diagram as informative, streamlined and understandable as possible. Data flow diagrams are useful to create a general overview of the system or to document major data flows. Here are the library of symbols used in data flow diagrams (DFD). Data Flow diagrams are graphic means of business process visualization. Any business process may involve the data transfer. It can be easily shown using data flow diagrams. DFDs are used to represent the processing and transformation of data within a business process. One can find out the Vector library of DFD symbols, that is a component of ConceptDraw solution for Data Flow Diagramming and is welcome to use in as addition to the common ConceptDraw DIAGRAM v12 diagramming facilities.